The Russian Centre of Science and Culture in the Indian capital held a special seminar looking at the role that India’s leader played in developing bilateral relations. A seminar titled “The personality of Indira Gandhi and her contribution to the strengthening of Russian-Indian relations” was held at the Russian Center of Science and Culture (RCSC) in New Delhi on Tuesday, November 19. The programme, which was organised by the center jointly with the Federation of Russian-Indian Youth Clubs, was dedicated to the 96th birth anniversary of India’s first woman prime minister. It was attended by well-known public figures, journalists, and Delhites interested in Russia. Many people spoke about their meetings with Mrs Gandhi, about their views of her legacy and her role in the rapprochement of India and the Soviet Union. 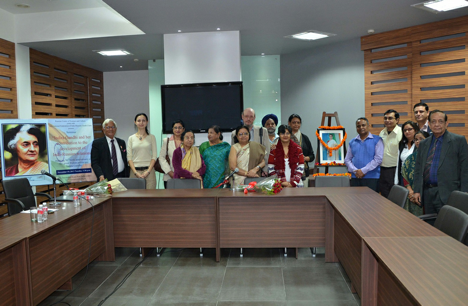 The eminent public figures present included Nirmal Bhatnagar, Dean, Department of Journalism and Mass Communication Jagannath Institute of Management Sciences, Sudesh Bhalla, Educationist and Retired Principal of Maitreyi College Chanakyapuri and Dmitry Chelyshev, Culture Counselor of the Russian Embassy in India. Mudita Gupta represented her recently deceased father, famous Indian doctor, A.K. Gupta, who made a great contribution to the development of his country’s relations with the Soviet Union and subsequently with Russia at different levels. “Indira Gandhi was truly an outstanding leader, and she had a great impact on world politics, both as the Prime Minister of India and as one of the leaders of the Non-Aligned Movement,” said Chelyshev, noting that the political and economic relations between the USSR and India were at the highest level in the late 1970s. Back then, the Soviet Union was the largest trading partner and arms supplier of India. Chelyshev said a famous poet and playwright in Moscow had announced recently that he was going to write a musical on the theme of Indira Gandhi’s life for her 100th birthday anniversary in 2017. “This is evidence that the memory of her is still alive, including among young people,” the Russian diplomat said. She recalled that Indira was very close to Russia, and relations with this country meant a lot to her. It was during her leadership that they flourished to a peak.